We are now ready to peel. Actually, many cooks dread this next part. Eggs can be notoriously difficult to relieve of their shells. The instructions that follow added to the steps I have outlined already should make this much easier though! Pick up each egg and find a spot where the shell and the inner membrane are coming off. 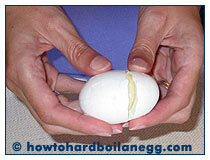 At this point, the egg shell can almost be smoothed right off. If the shell is sticking, you can hold the egg under a tap to help get the start you need. The gentle force of the water can be enough to liberate the membrane from the egg surface and then with that will come the shell. Be patient if it doesn't start right away - with some gentle exploring with your fingers, you will start to feel where the shell is loosest on the egg beneath and you can concentrate on using that as a starting point. 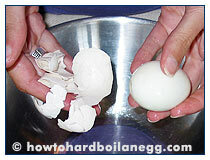 After you have peeled the shell off of the egg, give the egg a rinse under cool running water to get rid of any little bits of shell that may be left on the egg. oops whacked that one too hard! 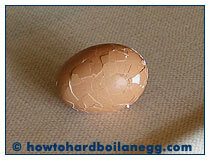 see the cracks easily on a lovely brown egg! Congratulations! 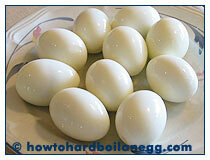 You are now ready to use your plate-full of hard-boiled eggs in your favorite recipe. You can see that I started with a dozen and now have 10 perfect ones. It is common for one or two per dozen to crack or peel badly, so it's good to have a couple of spares. If you need 6, cook at least 7. If you need 10, cook the whole dozen. You can always enjoy one right out of the shell! Remember to refrigerate your eggs if you are not using them right away in your favorite recipe. They will keep for a day or two no problem. If you are looking to make egg salad, you might enjoy my egg salad recipes website for some very delicious recipes (if I do say so myself!) 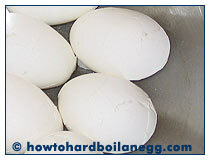 And egg recipes has a few extra recipes I am adding and developing as well for your enjoyment. If you have any feedback on these instructions or any questions, I am happy to hear from you. Please use the contact form on my website and I'll get back to you as soon as possible!